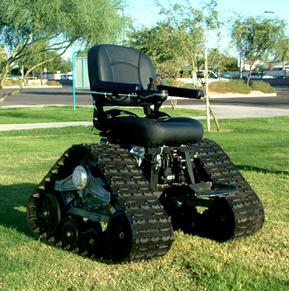 Offroading With The Tank Chair | OhGizmo! Nothing like starting work, on a Monday morning, pondering just how awesome life would be if you got to get around on a tank chair. Like this one. Of course, this particular chair is designed for people that actually need it, not just people who’d enjoy terrorising old ladies on the sidewalk. It appears to be the brainchild of a dad, who one day, while camping, realized his wheelchair-bound wife was unable to enjoy nature as much as she would have liked to, due to her current chair’s limitations. 2 years and lots of sweat later, the Tank Chair was born. With it, you can conquer snow, mud, sand, gravel or whatever else nature throws at you. Though, it seems you need to actually be disabled to own one. And, well, no idea what the sticker on that thing could be. This is a really a product for disabled people that needs to go places on their own where a traditional wheel chair ain’t good enough. It looks awesome, doesn’t it? Seriously, as somebody who spent about 11 months on crutches because of Lyme Disease joint damage, and at the time had no idea how long that might last, being able to use something that does not excude the “I’ve got some major limitations here” vibe could be pretty helpful psychologically. i want one so bad tha’s awesome! I'm not sure a person who's body muscles are too weak to carry him would be able to stay in the chair as it careens over creekbeds and hill tops. It goes for about 15 grand. However there is another one made in Mineapolis called a trac chair goes for about 12 grand. Google up track chairs and you can find others.